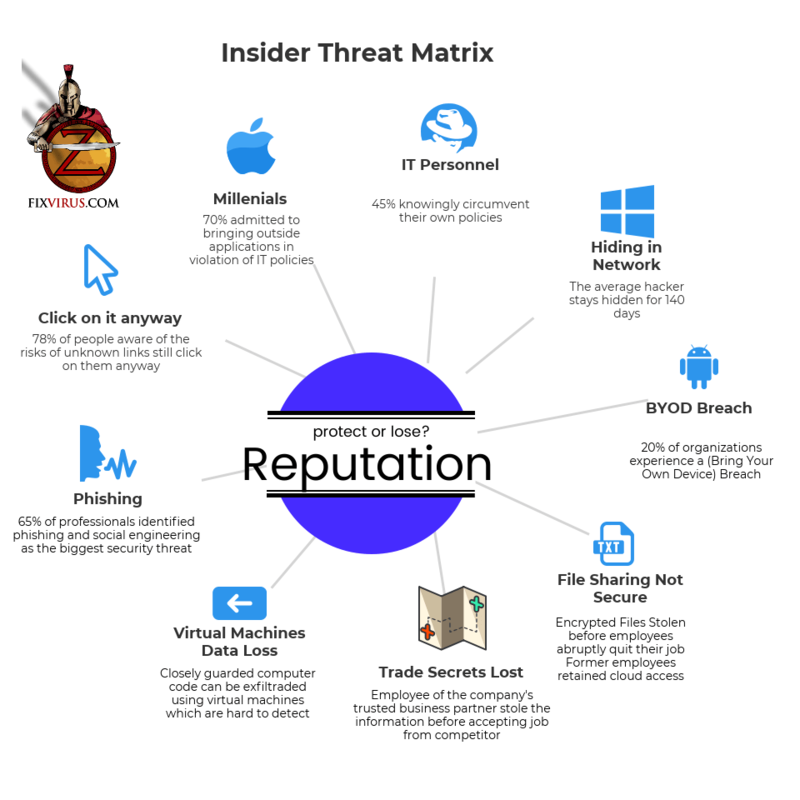 Not all Insider threats are malicious in nature, some problems are just laziness, incompetence, not paying attention, or just plain mistakes. 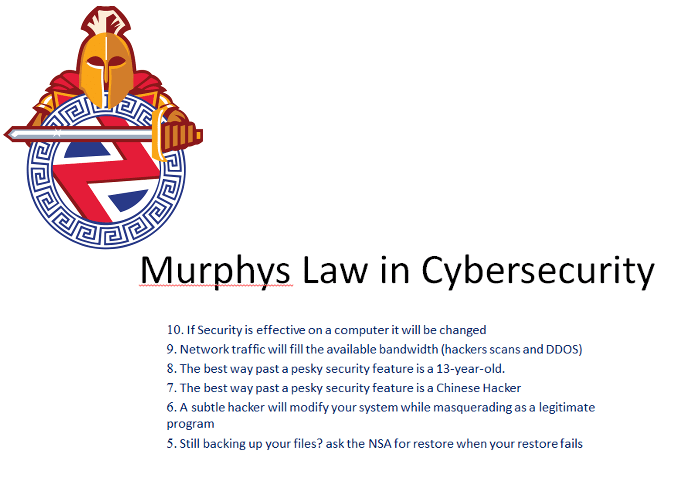 How does Murphy’s law for Cybersecurity work again? Social engineering is when a someone (usually an evil criminal hacker) tries to trick you by using your good intentions of going about your business on an every day basis. What happened when evil hackers wanted to change Point of Sale Credit card systems? They were not turned away at Michael’s and in fact were allowed to install their own credit card systems, since no one checked if that was sanctioned by corporate or otherwise(no process to see that) and sales associates go along with social engineering scams if they are well executed. Then of course the evil hackers captured all credit cards as used by shoppers in that location. The average hacker stays hidden in the network for 140 days. Virtual machines Data loss – closely guarded computer code can be exfiltraded using virtual machines which are hard to detect. When we do not double check a single mistake can blow up to a serious mistake and then it mushrooms from there. The biggest problem with Cyber attacks is that they are hard to find and attribute (find who did it and blame them/ arrest them). That is why it takes so long to find an attack that was successful (140 days or more). If you have not thought about this then it is high time to do it. Cyber attacks are becoming more sophisticated and can cripple your business by taking over key pieces of machinery. 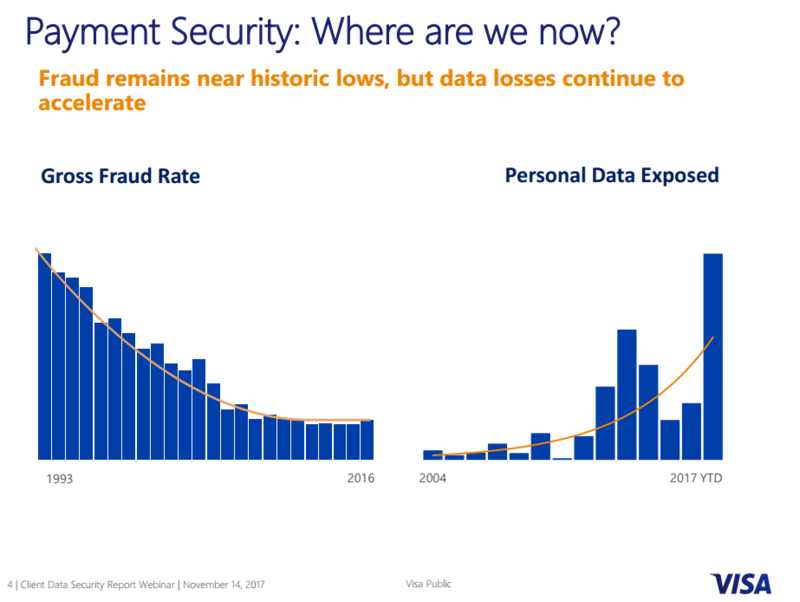 As we move to the new year (2018) and if there is no thought put towards cybersecurity… Then it is high time you did because the solution is not very hard or that costly if you compare the loss to your reputation. There are actions to be done to minimize risks. An average Hacker stays hidden for so long you will not know what is happening until it is too late. Do you know how companies find out? When the authorities contact the company and tell them the bad news. Employee of the company’s trusted business partner stole the information before accepting job from competitor. File sharing not secure, as drop box or other programs can be abused by employees before they leave to other jobs. Although each person makes a decision of good vs evil you have to help them make this decision a right one by setting the checks and balances within your company, and letting everyone know that there is a review of your actions. So if something does happen there is a paper trail, and it is not “lost” which is always the evil thought (they won’t find me). The key is to get your company up to speed as the bigger companies do (what is called the Enterprise companies– 1000 computers and larger). Contact Us as a CISA certified person we can help you with GRC (Governance Risk Compliance) as an enterprise company does things it always leaves a trail so that a criminal internal or external can be found. People by nature are quantitative. Meaning, people would believe a fact if the parameters of the fact were exactly defined. And when it is, they scrutinize it even further by asking about the basis of how the parameters were considered or under what maximum circumstances were these facts tested or tolerated. People always find a loophole whether or not the scrutiny is triggered by knowledge or ignorance. Sizing up what is indefinite in the field of cyber science, like projected risk exposure budgets, risk recovery figures, and intensity of cyber security know how, not to mention having to recommend what proper action needs to be done to prevent, recover or mitigate a cyber attack, is a challenging role. Not all people are open minded about including IT maintenance costs in their business budget ahead of time, so that proper infrastructure or network check ups can be done to avoid higher recovery costs in the event an unsuspecting cyber attack occurs. Preparing one’s business before a sudden unrecoverable cyber attack is like having to decide if a baby will be immunized early in life. Similar to taking care of a baby before the baby becomes sick, you have to increase the body’s defenses early so that when a sudden sickness comes about, the body has enough defenses to mitigate and recover from the external force. Ignoring these possible sicknesses amidst blatant viral or bacterial exposure will lead to higher hospital bills or even fatality in the case that the meager defenses of the baby’s body can no longer hold up. If your business was like a baby, would you not do everything to ensure that it grows healthily, knowing that every day, exposure to external factors are always at hand? You know that there are a lot of diseases that can happen to a child, especially if they are left unprotected by immunization, healthy food and healthy environment. So if you heed precaution, the growth will be a healthy success. And if you don’t, well, you may have saved a few dollars from the start by not taking immunization into consideration, but in the event the baby becomes sick, recovery may be void. Simply put: Why is there a need to look deeper into your cyber risk status? We created an infographic that helps explain your understanding of why we may act in a manner that is contrary to what we should do. This is generally how the brain works when faced with the concept of cyber network and infrastructure health. Computers have upended many things(where else can more capabilities cost less year after year?) including now in the security area. As more people connect to the Internet, more business is possible (more sales) but the risk increases as more criminals also connect and learn how to perform hacks so they can make money. Unfortunately as more people connect higher risks and higher costs in Cybersecurity are mandatory just to keep up. It is not like the industry is staying still(payment card industry)… but as time goes on more data is at higher risk. this chart has a cost built-in. Focus on the positive health impact to your business (just like a babies health) to gain more and for your projected IT maintenance budgets to be sufficient. The more defense, the lesser the risk. The higher opportunity of ignoring what is needed in your business technologically, will eventually lead to losses in the event that a cyber attack occurs due to limited defenses. Preparing ahead and thinking ahead no matter how undefined or developed the cyber diseases shall be, if you are taking care of your technological health properly, then you can expect constant growth to your company. Contact Us to discuss risk assessment analysis for your business. It is a known fact: technology is always on the move for progressive changes. So as the phase of virtualization becomes more advanced, it is imperative that we also look upon the parameters of cyber risks and controls oversight, in order to maximize the benefit of virtualization. Oversight controls pertains to seeing in advance, the possible cyber challenges of managing the information technology. Part of a control is to review Cyber Risk of a business, as well as planning, testing and executing methods of recuperation and resiliency to avoid critical risks and losses for a business. In other words, it entails thinking outside of the box, attempting to size up and prevent, if need be, unwanted occurrence and re-occurrence of high risk situations; hence the term oversight controls and risk controls in order to protect a managed virtual environment. Without the proper know-how, a business wanting to gain more leverage against its competitors by using cyber advancement or automation may actually lead its business to ruin. So instead of paving its way to a more effective and efficient business, it may go the opposite way just because they did not look into possible risks, no matter the complexity, before they actually happened. Are you using a shopping cart in your site? Is your shopping cart exploitable? Are you using WordPress for your online business? Is your WordPress site exploitable? Have you ever used add-ons for your site that may actually be a means for higher vulnerability? What plugins are susceptible to attacks? In the advanced stream of technology also comes the advanced stream of risks and vulnerabilities. To enjoy the beauty of technology it is always an advantage if we know how to detect, exploit (to one’s own business advantage) and prevent these cyber risks which challenges proper oversight controls. Oversight management as well as risk management are pertinent arenas to be considered when one is a player in the universe of virtualization. Aside from this, a business owner should also know what the costs in the business are if the network fails. No matter how we think managed servers may be the better option to run in your business, as it will minimize overhead cost in maintaining the business you have started (not to mention being able to compete head to head in the e-commerce world), having a Risk Manager and Consultant who would think about the what if’s is a great control measure to minimize and prevent cyber vulnerabilities. True nothing may happen, as it is a “what if” but the risk of failure is so high that doing nothing is even riskier. So the question is, as the ultimate “Risk Manager” (if you are the decision maker) what is the minor cost that you can live with? Our best suggestion: Test your devices, network and systems using a qualified individual. Contact Us and experience the empowered difference of a sound virtual environment. Small Businesses Do NOT Get Hacked! Maybe so, but then again, maybe not. Think again. Cyber defense is not a minor concept that any business owner can just dismiss as this can post a grave threat even to the simplest business type. 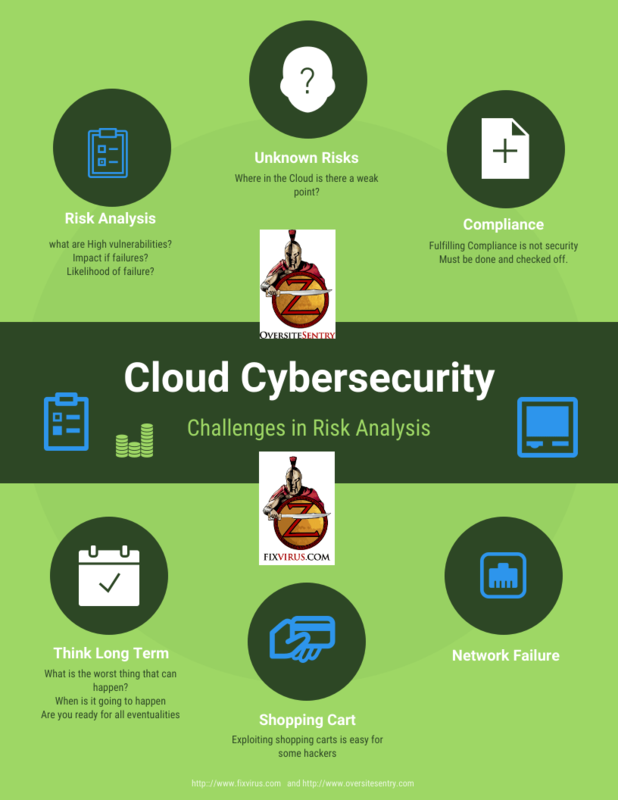 Let’s dig deeper and discuss in plain language what you may need to know with regards to your Cyber security. Ask yourself these questions: Do you run computers in your business and have a domain that you maintain, or servers that are connected all the time to the Internet? Do you use computers to look-up websites or to generate more leads and to process online payments via credit cards for your customers? In other words, if you are you using computers to perform business processes for standard uses in the delivery of marketing, sales or servicing your clients, — which of course, you most probably are, it is imperative that you must give time to review and protect your hard earned assets. As most businesses get more efficient by using computers and software that help facilitate the business, Cyber protection is also a must for your industrial infrastructure. All these are quite basic, so why do I mention these? What is it then, that can happen to your computers without the proper cyber defense? Here are some truths below. Risk management in the age of Cyberattacks. The problem with constant threats of Cyberattack is that one has to work on the highest risk to counteract on first. Large scale companies (those of more than 1000 employees) have Cyber Security Departments who review specific security threats, depending on their environment, business portfolio or on their technological situations and hire accordingly. To ensure that you have what you need to do in this day of higher risks and unknown attacks, it is always beneficial if you perform information security reviews or infrastructure checks more regularly, by a qualified technological individual. You don’t need to go far to talk to a professional. Contact Us and we’ll help you identify your potential infrastructure hazards, vulnerable computers and potentially high technological risk situations. Cybersecurity Attacks Never Strike Same Place Twice Right? 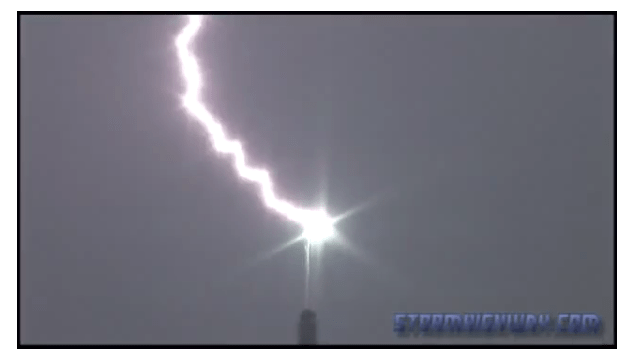 As you see in the youtube video, lightning can strike the same place 50 times actually. This makes scientific sense actually, as the WVAH tv tower shows if a metal rod is the highest point during electrical(thunder) storms. And since it is the highest point the large amount of positive energy in the clouds will create electrical circuit for a brief instant to jump to the rod. So in cybersecurity do you think if you had a weakness in process 10 years ago and did not fix it, unfortunately a cyber breach occurred. Now that it occurred once would it occur again? Or in another brain teaser – If your process is not good enough to prevent a cyber breach will you be breached even though you were never breached before? 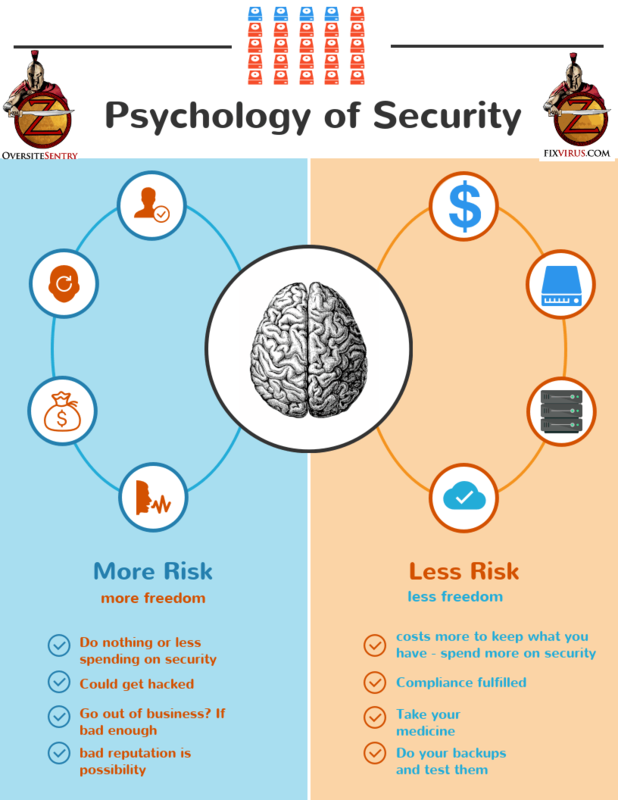 The entire Psychology of Security should be dumped in the trash can. It is not wise for most of us to ignore or delay reviewing our cyber defenses for any reason (including cost). The cost of a cyber breach goes so high as to even result in destruction of the business. This makes sense as if you have an incorrect defensive cyber process the breach may cause data loss in the form of Ransomware on your devices. As you may know if you have a cybersecurity vulnerability on your machines they are susceptible to Ransomware which result in your loss of data. So what you say, I have a backup, so it will not effect me. 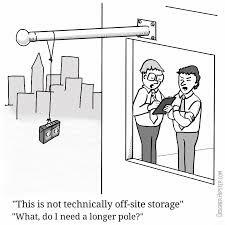 That may be true, but have you tested your backup to make sure it will actually result in a seamless transition? In other words, a test for you to see the restored data on a separate machine? If you have not actually tested the restore then one is leaving the corporation on a risk of how well the backup was performed. So you may get a partial recovery, which may or may not be enough to keep you in business. The answer to the question do Cyberattacks hit the same place twice, yes of course. Due to the hackers making large attacks looking for vulnerable machines. If 20-25% of machines are not patching their machines on a regular basis then millions of machines are susceptible to attacks and will make more attacks themselves. So the exact opposite will happen, just like on the radio tower that is the highest point in an electrical storm, the weak computer machines will create more and more attacks, thus finding all the weak machines and infecting them. So the maxim will be: If you have a weak machine then it will be attacked no matter if you have been breached before or not. And one of these days the attacks are going to be successful, which means you will lose your data to ransomware. And I hope you have tested your backups. 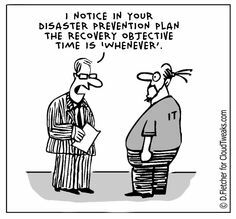 the day of a catastrophe is not the time to test your restore process.